Our readers are our writers! Email us a writeup and photographs of your cruise to Portuguese Island & we'll send you a cruise discount voucher. 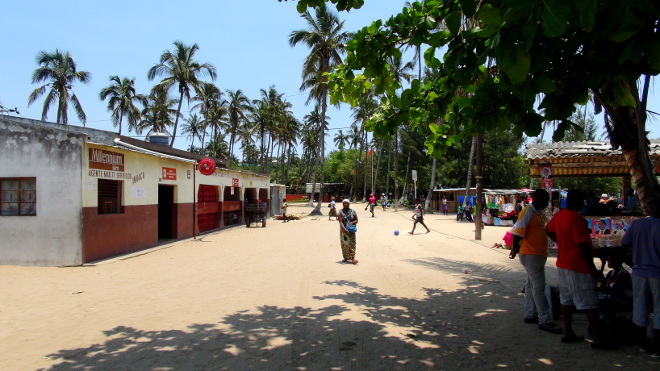 Portuguese Island is a small, uninhabited, sandy island situated at the edge of Maputo Bay, very close to Inhaca Island. 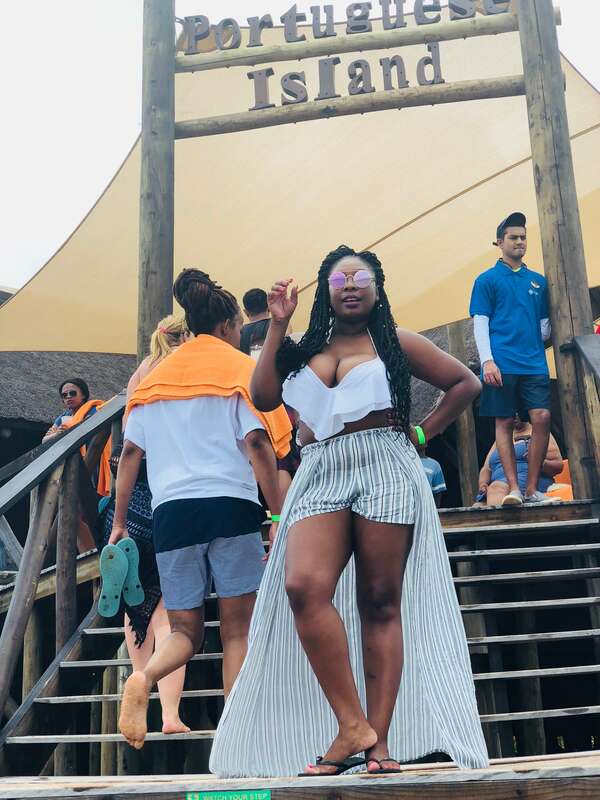 This is one of the most affordable and popular destinations to visit if you're looking to travel to an island on a cruise from South Africa. 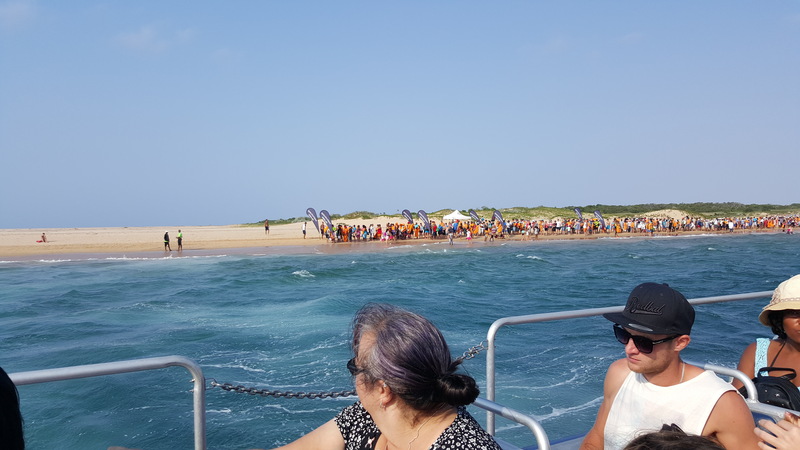 The 3 night/long weekend cruises go to the Portugese Island, while the 4 night cruises usually visit Pomene or Maputo as well, all departing from Durban. Whilst the 3 night cruises are cheaper, we recommend going with the 4 night option (even this is too short). Other than a few thatch-roofed buildings set up by MSC Cruises, Portuguese Island is compromised of pristine stretches of beach skirted by the warm waters of the Indian Ocean. A walk around the island is recommended, covering some 6km (put on sunblock!). 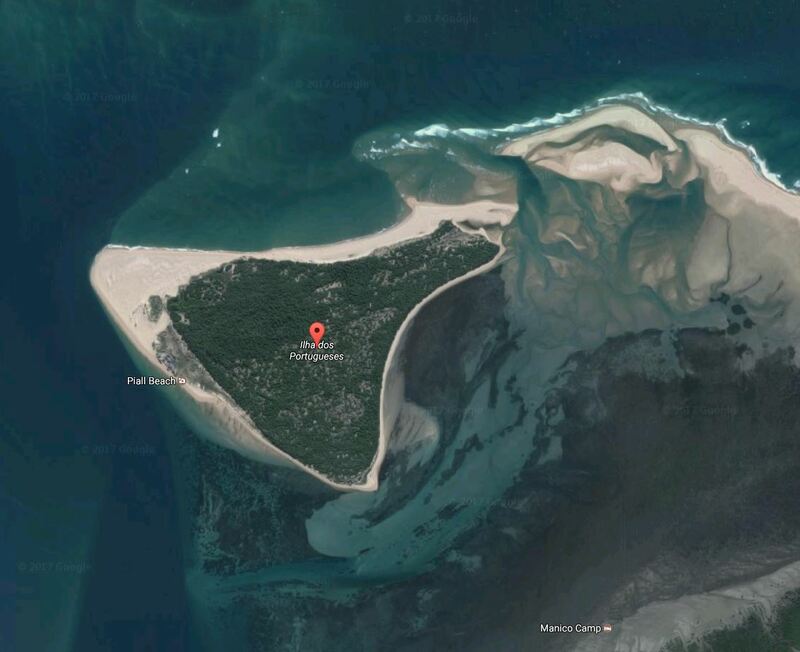 As you can see in the map below, Portuguese Island is on the opposite side of the bay to Maputo. Zoom in to see the island in detail. If a picture tells a thousand words, a video is an encyclopedia - watch the below to get a good idea of what the island is like. Obviously the video was taken in perfect weather; which is the case a lot of the time, but sometimes it's overcast, sometimes too windy so watersports are cancelled, and on rare occasions the water is too rough to even go to the island. Here is a close-up of the island. As you can see, it's completely unspoilt, with the only structure being what MSC have built on the south-western part of the island. To the bottom right of the photo you can see a tiny bit of Inhaca Island. Portuguese Island is sandy with light vegetation. 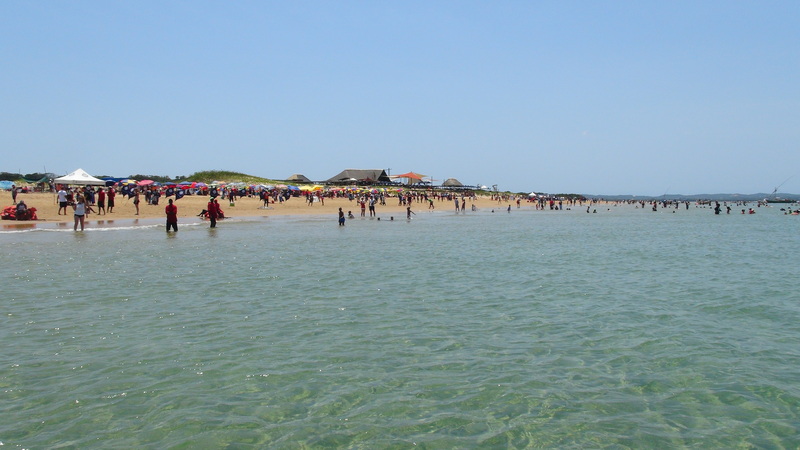 The beachsands are great for going for a walk on, but do wear shoes, as the sand can get very hot in summer. Portuguese island is a perfect getaway for families or friends looking for the original island experience. The key to making the most of this day trip is to enjoy the primitive charm of beach and clear warm water. 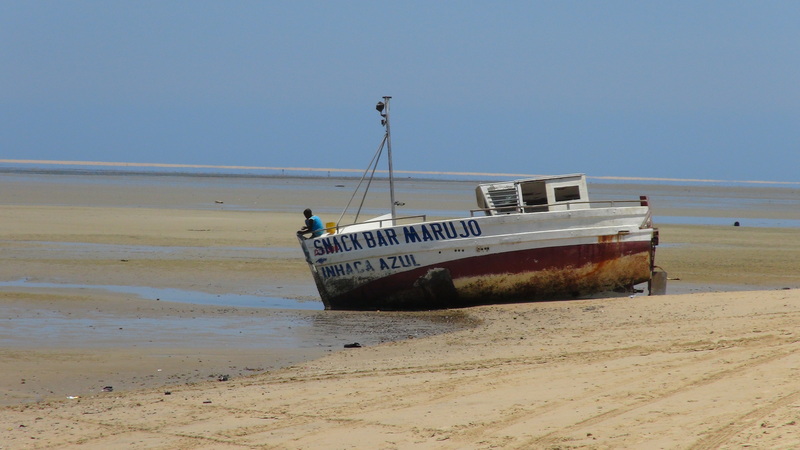 Top tip: Usually most people flock to the closest spot once getting off the boat, but we recommend taking a stroll past the local vendors, buy some Tipo Tinto (Mozambiquan rum) and head to a spot further on, where it's less crowded to chill and relax in the lukewarm water. Remember an umbrella and sunscreen, as a long day in the sun can leave you looking like a crayfish! Umbrellas can be organised onboard. Shoppers can look through the range of clothing set up at the Portuguese Origins Market, a temporary market established by the locals. The cruise ship is anchored off Portuguese Island, and passengers are ferryed between the ship and Portuguese Island. Be prepared for a relatively bumpy ride, getting wet and to possibly have your hats blown off your heads (and before you ask, the boat doesn't turn round to pick it up). To return to the MSC Sinfonia, you may need to stand in the queue for longer than you expect (an hour or two), so be sure to use sunblock. A few years ago MSC Cruises used to ferry passengers using zodiac speedboats. The trip could be a bit bumpy, and the wearing of lifejackets was compulsory. 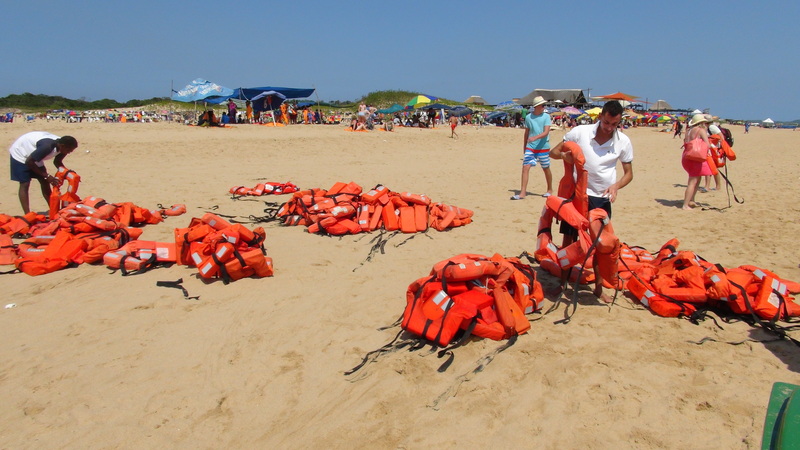 In the old days, to get back from Portuguese Island on the zodiacs, you needed to wear a life-jacket - one grabbed a life jacket from the pile on the sand south of the area with the hut, and then joined the queue to get onto a zodiac. 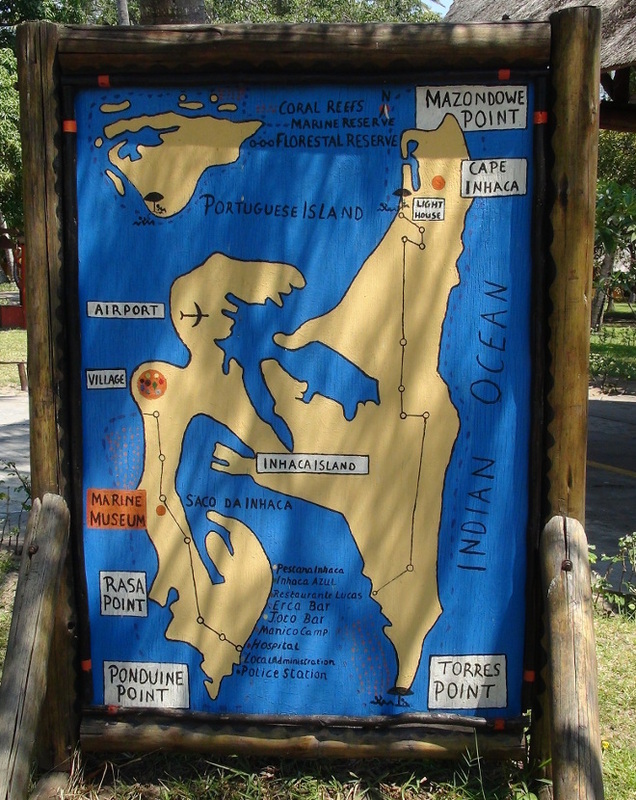 We can see Cape Inhaca, Rasa Point, Torres Point, Inhaca Airport, the Marine Museum, Ponduine Point, the lighthouse and Mazondowe Point. 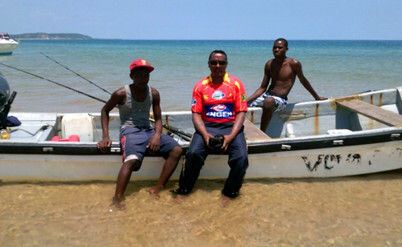 When you get to Inhaca, take a left turn on the beach and walk to Inhaca village. Inhaca village is not on the beach, so after about 300m (just after you see the boat in the photo below) turn right to go inland. There are usually a few locals who will try to guide you or otherwise follow you, in the hope of getting a tip. Let them know upfront whether they will get anything (even if you say no, they often continue following, and may even sit outside a restaurant you go to, waiting for you). There are a few restaurants to eat at, on Inhaca: Lucas, Hotel Pestana and Erca. 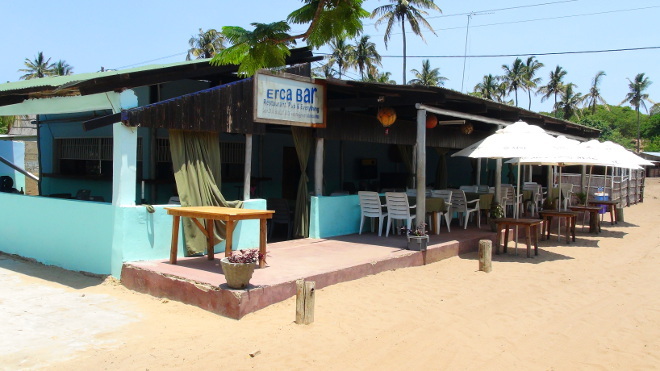 Erca offers some respite from the sun - note the MSC labelled beach umbrellas, and its modest claim to provide a "bar, restaurant, pub & everything"! We enjoyed a few beers and cooldrinks there. 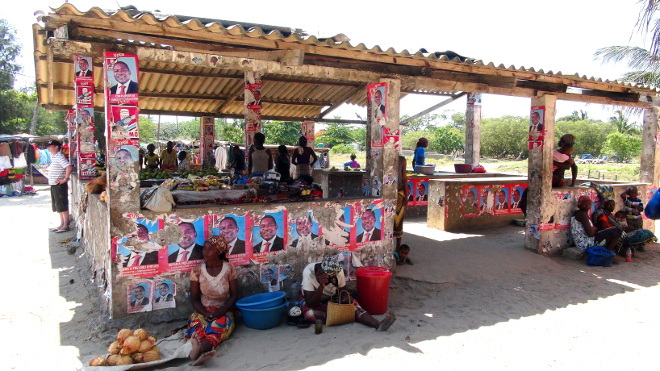 The Erca Bar overlooks the local market, and is across the road from Lucas. Lucas is well known for its tasty food. Note that the restaurants tend to take longer than South Africans may be accustomed to, to prepare and serve their dishes; so avoid the restaurants if you are running late. Be sure to order a coconut to drink from the local market - it cost R10 when we were there in December 2014. The Portuguese island and Inhaca are two islands in the bay of Maputo off the coast of Maputo, Mozambique. On the map of the island, you can see that it looks like a big extension to the sandbanks of the lagoon of Inhaca. In the 16th century Portuguese traders used the Portuguese island as their main port to trade ivory, from there the previous name "Portuguese Elephant Island". The island has since not been further developed and maintain a modest inland surface with grassy dunes to explore if you've got some time to spare. Just remember to take some flip-flops - scorching sand is not your friend! No need to research the top markets and stores on the Portuguese Island, as the market will come to you! Buy some fresh mangoes, kiwis, coconuts, local rum, woodwork carvings, sarongs etc. from the local vendors walking around on the beach. Facilities are limited, so if you don't feel like rocking up and seeing what's on offer, we recommend packing a day bag and bringing your own drinks and snacks to have a picnic. MSC have built a lovely beach bar on the eastern end of Portuguese Island. 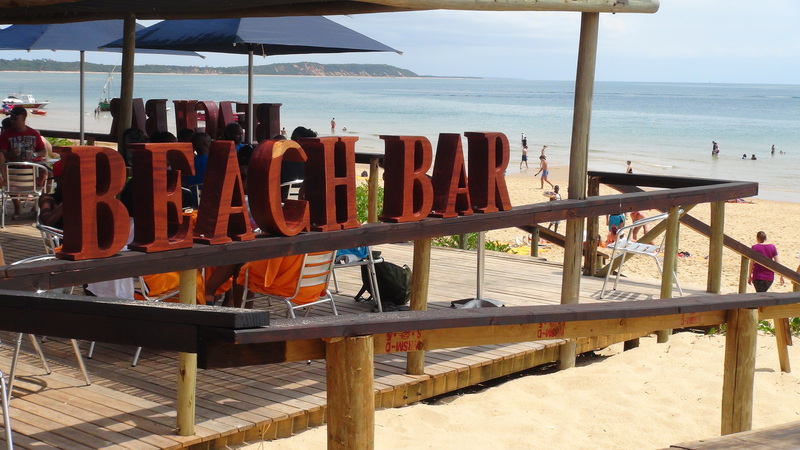 It's got a vibey atmosphere, and is a good spot to enjoy a cocktail whilst soaking in the beach atmosphere. We did notice that the barmen aren't always aware of all the drinks on offer, so have a look around whilst waiting at the bar. 1. Do I need a passport to go to the Portuguese island? Probably the most frequently asked question - YES. 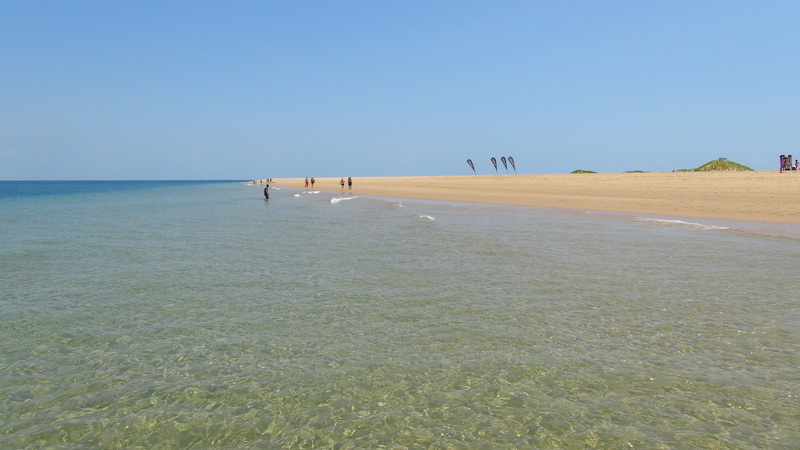 The Portuguese island is part of Mozambique, so you will need a passport as you are visiting an international destination. 2. What currency is accepted on the island? South African Rands, US dollars or (in the unlikely event that you have some) local currency. 3. How long do you stay on the island? 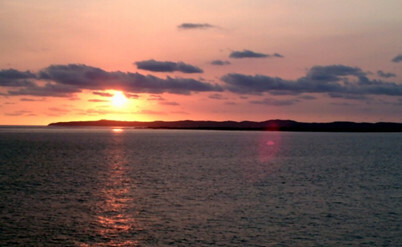 The ship stops at the island early in the morning and the last transfers are in the late afternoon (check the itinerary for your specific cruise for times). The shore excursions change from time to time and are not available to book long in advance, but here's some info to help you get an idea of what's usually available. Note that the watersports are cancelled if the weather isn't conducive. Also note, that the prices have probably changed from those listed below - ask your cruise consultant what the current excursions are, and pricing. 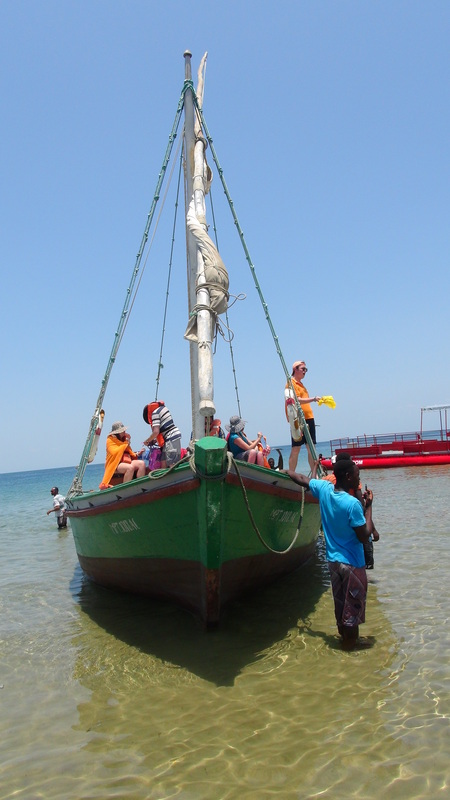 Boats will take you from the vessel to the landing point, which is right in front of the in Inhaca Pestana Resort. There are some seafood restaurants, bars, curio stalls and the opportunity to do some bird-watching. This excursion departs very early and is weather-dependent. 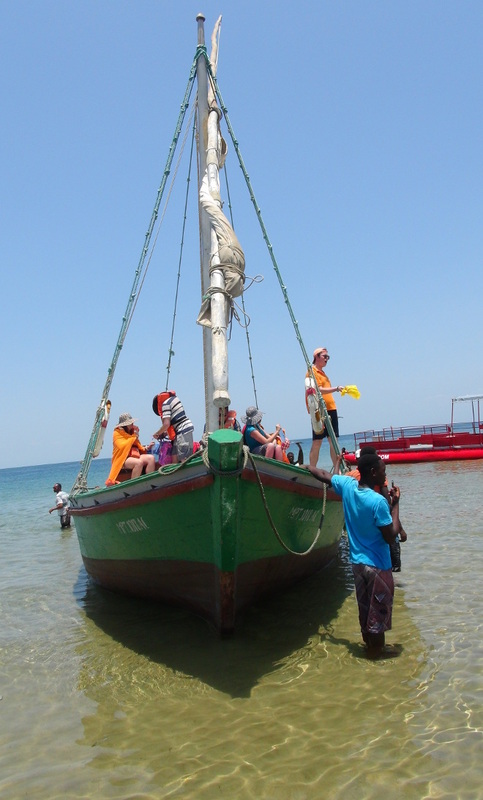 It is advised to wear beach wear and sandals, as during low-tide passengers will need to wade through knee-deep water. You can choose between a regular transfer or a fast pass. 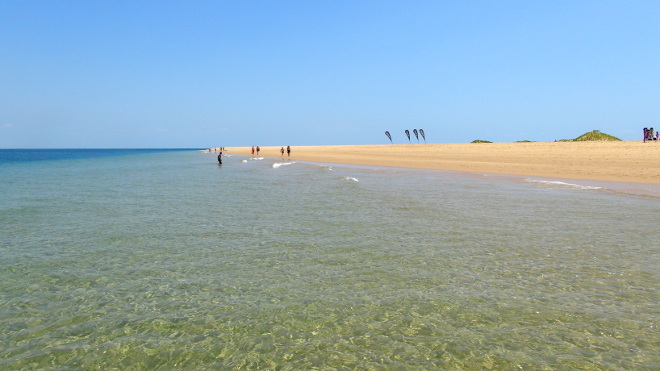 Starts from the Portuguese Island, a 30min sail to "Coral Gardens", the only surviving coral reef in Maputo. Snorkelling gear is included (snorkel, mask, fins), but you're welcome to bring your own, as sizes are not guaranteed. There is a variety of marine life that to be explored; and it's highly unlikely, but is possible, that you'll spot a Dugong. There is a cash bar on the zodiac for your convenience (soft drinks and water). Kids below 12 can't take part in this trip. Passengers need to be medically fit (no back or heart or ear problems, allergies or if you are currently taking meds - please check as failure to take notice won't be refunded of you're not allowed go). Visibility depends on the conditions of the day. 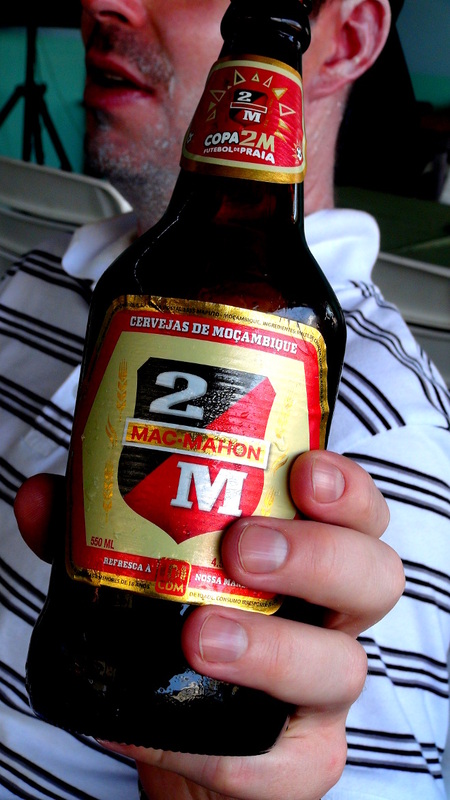 It's advised not to drink alcohol before going and wear a shirt, hat and sunscreen. DON'T stand on the coral! We want to preserve it for as long as possible. Minimum age is 12 years old. 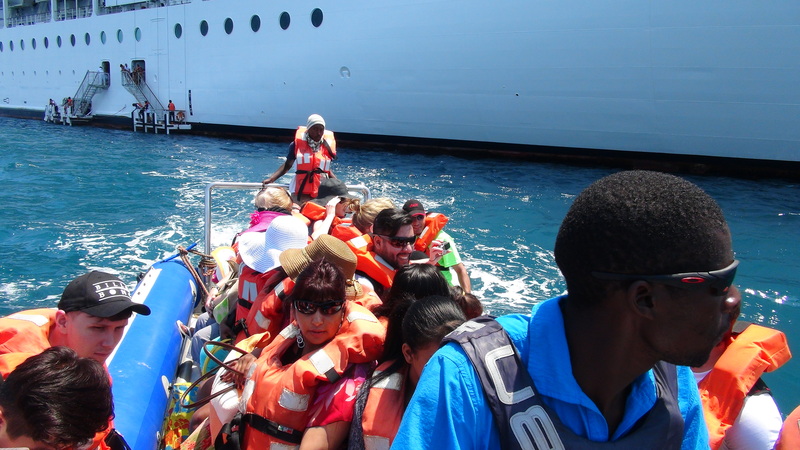 Trip is 30 minutes (starting from the time you collect your life jackets). Fun fun fun on an 8 rider! Minimum age is 8 years old (Parental supvision is required for children 8 - 12 year old). 10 minutes. Participants need to be able swimmers. Eight riders, max weight 90 kg p.p. This gives you priority in getting off the boat at Portuguese Island; and allows you to be pampered and feel like a king at the island - you'll get your own beach umbrella, lounger (hence the name) and drinks table, along with a free drink an fruit plate. The exclusive area in which you'll be placed will include a private bar service. If there's any chance of the weather worsening during the day, go as early as possible, as the Captain will not hesitate to stop transfers to Portuguese Island if there's any risk involved. MSC used to transfer passengers from the Opera and Sinfonia to Portuguese Island on "zodiacs", which are hard hulled rubber ducks. Nowadays, far larger boats are used, but you should still expect to get wet as the boat pounds into the swells again and again. The boats used are the MSC Flamingo, MSC Albatross, MSC Pelican and there is a fourth (whose name the author can't remember!). On the Island MSC chefs braai meat and cook food to be served to the many passengers. 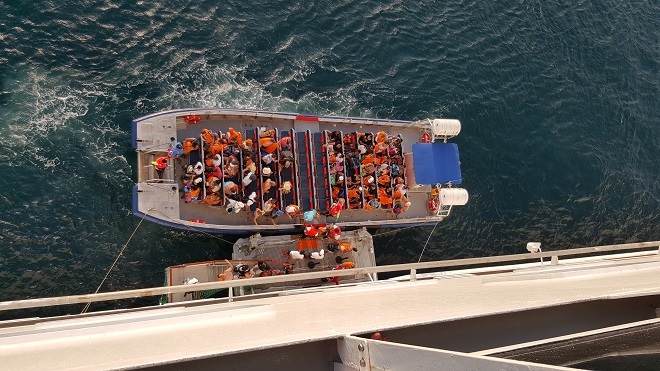 As there can be over 2000 passengers and almost everybody wants to get off the ship, facilities can get a bit crowded, but there's plenty of place on the island for those willing to venture off. Activities include snorkelling on the reef off Inhaca, going for a walk around Portuguese Island (takes about 2 hours) and visiting Inhaca. The best thing to do, though, is to relax in the calm warm waters. 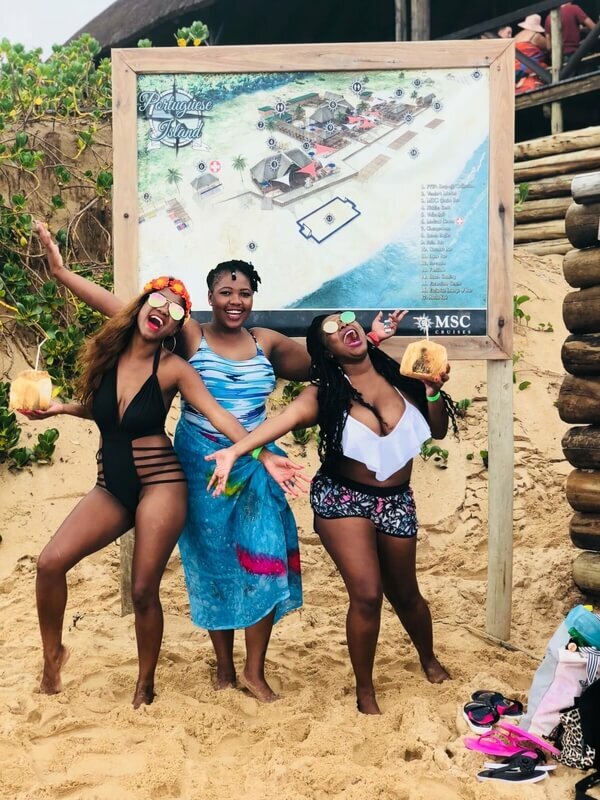 I cruised for the first time from Durban to the Portuguese Island with MSC Sinfonia from the 27th to the 31st of March for our 10th Wedding Anniversary and it was the best decision ever. I have been recommending it to my friends as the perfect holiday. The food was great and available around the clock. We had fun 24/7 as there was never a dull moment on the ship. Their entertainment crew has lots of energy that rubs into you. My review on a scale of 1 to 5: I will rate it 5. Reason being that tasty and delicious food was offered. Room service and cleanliness was beyond my expectation. Entertainment was excellent. I was also impressed by their punctuality. To sum it up if you are a happy person in general you will enjoy the cruise. The negative reviews you see are perhaps from individuals who are critical and inclined to let negative encounters overshadow many positive experiences. 2013-05-06 Rating 5/5 4’Oclock in the morning, how can anyone be up so early and be so happy (me thinking this of my hubby Eddie Pillay). It was not long and I started smiling and thinking how awesome this trip was going to be after the year he'd had - he really needs to relax and take it easy…lol not my hubby. By 9’O clock we had landed in Durban airport and were waiting for the transfer. I couldn’t wait to show Eddie my gift to him, you see Eddie was in hospital for 1 week in July and 2 weeks in September… all I have to say is he made it, by the grace of God he is still here today and this trip was to celebrate life! This was my 3rd cruise & the 1st for Eddie, and believe me, I knew I would get sea sick like I did before this but nothing could stop me from being on the ocean, I just love it. The excitement in the air at the airport as we wait for the transfer, the people and the stories they tell you, of how many of trips they had gone on, makes it just so much more exciting. Seeing the excitement in Eddie eyes as he is taking in everything like a child in a candy store made getting up early worthwhile hehehe. As we entered the port, this beautiful big ship standing there waiting just for us to explore her, to have fun and be happy on for 3 awesome days, this would be our home with no care in the world just us on this beauty. As I watched my hubby looking at this ship in wonder as if it was the most beautiful thing he has ever seen, I knew this was the perfect gift. When we went to our suite it was awesome, I dropped our bags and we made our way outside to go explore the boat, so many things were happening at that time out there, they were dancing on the 12th deck making everyone feel welcome, and the entertainment went on till the next morning. On our first night I got sick, yes & I got it bad, like stay in bed bad, but this did not stop me at all - we went to dinner, took in a show, we stayed entertained by all the things going on around us and we walked around on the boat. Our night was great! Portuguese Island with its warm blue waters and tropical fish swimming in the waters - it was like being in a semi-warm bath - you just wanted to stay in it. 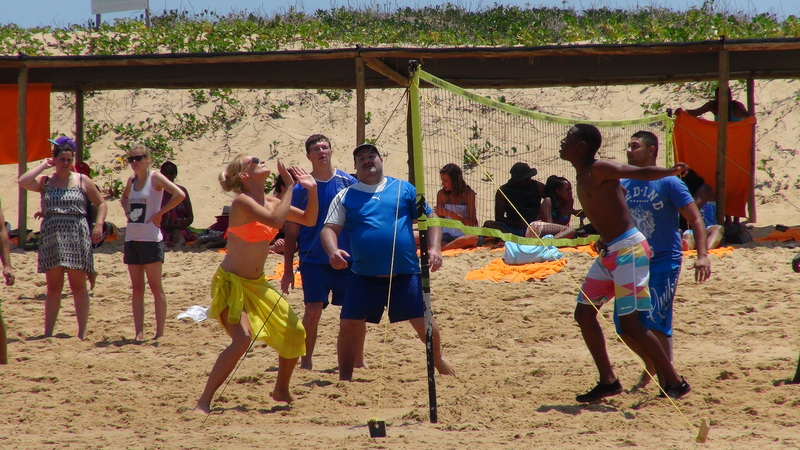 Watching Eddie, how he enjoyed himself, was priceless - talking to the locals, making friends, getting to know all about the island, taking in everything he could step by step. We took a very long walk on the white hot beach exploring every dune and checking out everything we could in the short time we had to do so. The unspoiled beauty of the island made me think how lucky most of us are, at being able to enjoy this - so blessed, to afford to come here. I know God is close to us and seeing this place so beautiful just made me more aware of how blessed we are. This is one of the most memorable trips we ever took, doing things together - the experience and memories will last a life time. Our last day onboard this beauty, sad but yet existed, knowing it will not be our last. Anchored in the deep blue sea, sitting on our balcony just enjoying being by ourselves with these awesome surroundings is what peace is all about, no stress just total peace. 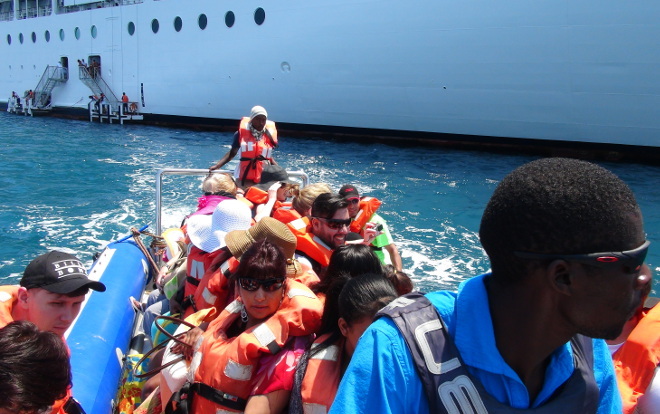 As we disembarked I still felt the excitement of being on the trip - the next phase of which would be to share with all our great experience and to plan our next boat trip. As we set foot on SA ground we found Eddie's bag was lost hehehe - ok it was not lost just misplaced for an hour and a half. I can truly say after a hard year behind us this was a great and awesome trip, oh yes, all was well, bag was found and we continued on with the other part of our holiday a week in PMB. 2017-10-27 Rating 4/ 5 The Portuguese island trip is one of our memorable vaccation vaccation as a family and it was our first cruise. The voyage with msc was fantastic and unforgettable. 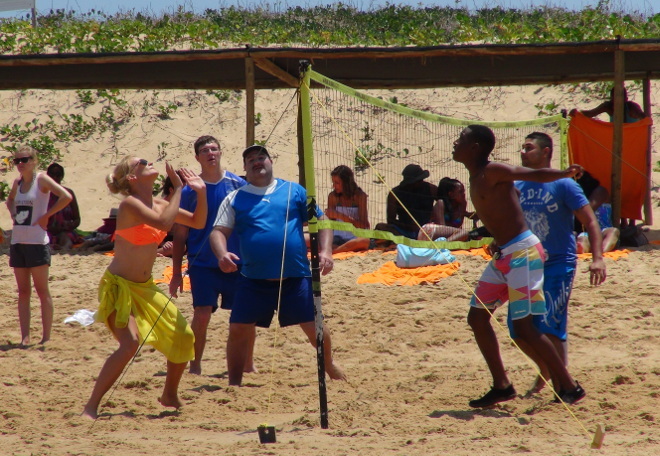 They have amazing staff and plenty of activities on board. We enjoyed the swimming pool and the Jacuzzi our little one love swimming. The beach was awesome. The waters were warm and the wire no big waves. 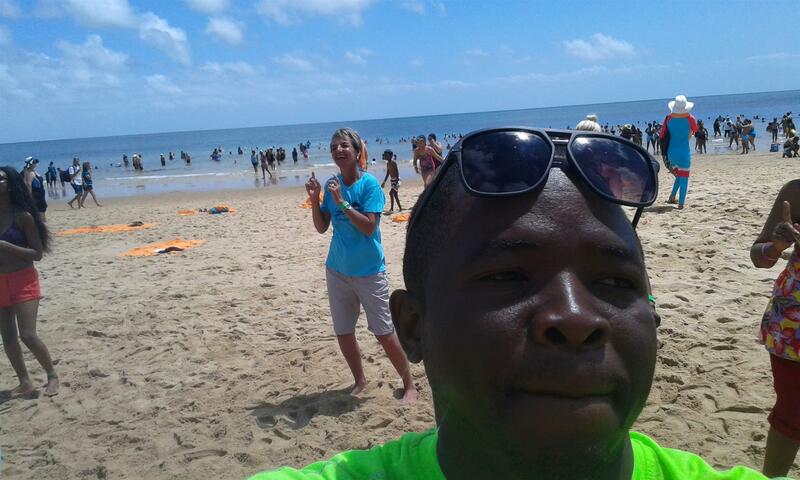 My husband enjoyed the Mr msc competition and he came second at the beach the dances were cool. It was so short because every hour was packed with action. The food is awesome. Plenty to our satisfaction. So much to say. But i can only say it was fabulous. Sounds like fun? 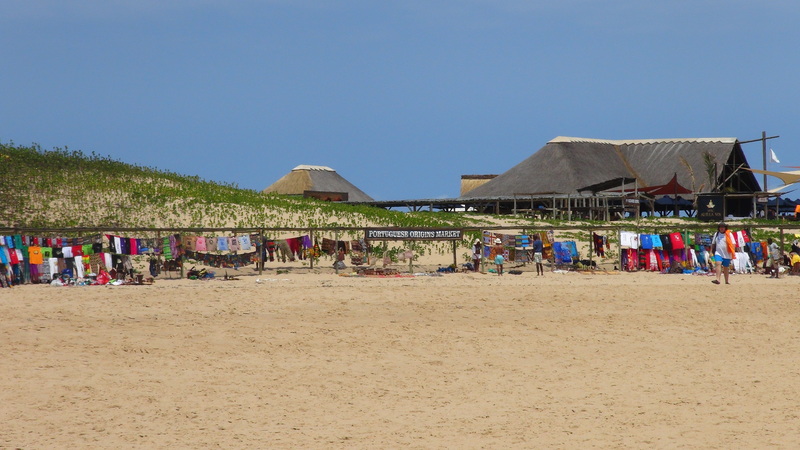 Navigate to our Cruises from Durban page to see which cruises go to Portuguese Island. Or if you have some dates in mind, pop a mail to cruises@southafrica.to to see what's available during that time. We are eager to help and have the best advice to suit your needs. STEP 1: Look at schedules of ship departures with itineraries on our Cruise Specials from Durban & Cape Town page. There you can see exactly when the cruise departs and where it's going and make a decision about which ones would suit your travelling group. When you know you definitely want to depart from Durban, eliminate the options by going to our Cruises from Durban page. Same goes for Cruises from Cape Town. STEP 2: Fill in the booking form on the page with your query, email us at cruises@southafrica.to or give us a call at 021-531-7453 (e-mail is better though, then we'll have your correct e-mail address to repond to with a quote). 2. Number of passengers + ages. E.g. 2 adults, 2 children (below 18 years), 2 seniors (over 60). 3. Type of cabin (inside = no window, cheapest), outside (window), balcony (sleep max of 2 people) or balcony suites (sleep a max of 3 adults OR 2 adults and 2 children under 12 years). Now get started planning your perfect cruise get-away, the sooner you book a cabin, the better your chances of getting the best prices.